The Switch From NAFTA to USMCA, What's the Same and What's Different? On January 1, 1994, the United States, Canada, and Mexico came together and signed the North American Free Trade Agreement (NAFTA). This trade bloc aims to reduce trade restrictions among the three countries, thus encouraging investment and increasing market access. Under President Trump's administration, the three countries reached a new agreement called the United States-Mexico-Canada Agreement (USMCA) which replaces the former NAFTA. These two agreements have many similar points, yet several unique distinctions as well. Long distance trading began during the domestication of pack animals and the invention of ships thousands of years ago. International trade is essential for individuals, firms, machinery and technology, and to whole countries. Trade occurs due to a countries' inability to satisfy their own needs and wants with their own resources. There are two fundamental principles (Division of Labor and Specialization) that are related to the production of goods and services in countries that want to trade. What began as an extremely lucrative and beneficial relationship between the U.S and China has become a hostile one that has potential to change the economic landscape of the world. With the latest round of tariffs covering nearly half of all goods exchanged between America and China, both countries are bound to experience some collateral damage. Should the USA be part of more Regional Trade Agreements? This globalEDGE Blog post is also shared as an opinion segment on the globalEDGE Business Beat on the Michigan Business Network (a radio show hosted by Tomas Hult). The first two Regional Trade Agreements (RTAs) that existed in the world according to the World Trade Organization’s database on RTAs were the EC Treaty (what has now become known as the European Union), which started in 1958, and the European Free Trade Association (EFTA), which started in 1960. Today, some 60 years later, we have 299 RTAs in force (predicted to be about 308 RTAs by the end of 2018). Complementing RTAs in the world are Bilateral Trade Agreements (BTAs) between any two of the world’s countries. These BTAs are more difficult to count exactly due to what can be considered an active agreement and what is considered a country. Given that we have 193 country members of the United Nations along with two so-called UN observers (Holy See/Vatican and Palestine) along with Taiwan and Kosovo (and 61 dependent and 6 disputed territories), the options are almost endless for potential bilateral agreements. Including both RTAs and BTAs, the United States is engaging formally in 14 active trade agreements. The countries included in these 14 agreements are Australia, Bahrain, Canada, Chile, Colombia, Costa Rica, Dominican Republic, El Salvador, Guatemala, Honduras, Israel, Jordan, Korea, Mexico, Morocco, Nicaragua, Oman, Panama, Peru, and Singapore. The first agreement that the U.S. entered into was with Israel in 1985, with Israel now being the 24th largest trading partner with the U.S. (amounting to about $50 billion annually). About a year into second his term, President Obama called Max Baucus, Montana’s then recently retired senior senator and offered him the job as the country’s senior diplomat to China. He readily accepted. Why don’t Democratic members of Congress support free trade agreements? The reason most often given is that historically Democrats have been the party of the working person. And since the conventional wisdom holds that trade destroys jobs in the U.S., Democrats have to oppose it. Related to this explanation is that labor unions are de facto extensions of the party and if they oppose trade then the party’s elected representatives must follow their lead on this issue. Since unions donate money to candidates they support, to favor trade means saying goodbye to these contributions and the votes they represent. China has been the world's number one importer of waste for the past 20 years. However, in an effort to address their growing pollution problem, 2018 marked the year China would begin banning imported recyclable waste from other nations. This ban applies to 24 types of materials including plastics, unsorted paper, textiles, and scrap metal and is predicted to include 32 more types by the end of 2019. As a result, countries around the world are scrambling to figure out how and where to dispose of their piling waste. The number of firearms produced and sold in the United States has continued to rise, and according to the Firearms Commerce in the US report produced by the Justice Department, the amount of firearms that are manufactured in the country have tripled since 1968. This may be alarming considering the fact that in the time it took the number of manufactured guns to triple, the US population has only grown by 35%. In 2015 alone, there were about 9,360,000 firearms manufactured in the US. Out of the 9,360,000 firearms that were manufactured in the US, only about 343,000 firearms were exported from the US in 2015, which is less than 4% of the total. Bitcoin has had an incredible year. Starting at around $1,000 in January of this year, the cryptocurrency is a mere $40 away from hitting five figures today. On August 18, United States Trade Representative Robert Lighthizer announced a trade probe of China's intellectual property practices. According to the Chicago Tribune, the probe is meant to verify complaints that "Beijing improperly requires foreign companies to hand over technology in exchange for market access." The United States government claims that these allegations amount to serious intellectual property and technology theft, meriting a thorough investigation that may take up to a year. The probe was invoked by triggering Section 301 of the Trade of Act of 1974, which allows the president to levy tariffs and other such restrictions on countries accused of "unfair trade practices." If the allegations against China are true, it is estimated that the value of intellectual property loss may amount to as high as $600 billion. A new video published by Dr Jagdish N. Sheth from Emory University discusses the economic factors that caused many United States citizens to vote for Donald Trump in the 2016 presidential election. 25 years ago, world leaders decided to create the G7 and G8 agreements to liberalize trade as a growth engine. As a result, general tariffs were abolished, the World Trade Organization (WTO) was created, and trade increased across borders. NAFTA and the European Union were also created, but in the process, jobs began to shift. The scope of global business and international trade has seen optimistic improvements throughout recent years. Many analysts and companies are becoming increasingly confident regarding global trade and overseas opportunities. This confidence is due to global trade growth exceeding initial forecasts as well as the stabilization of China's economy and demand. These particular factors could be indicative of a year without a major economy falling into recession, a benchmark that has never previously been reached. On June 5, the United Arab Emirates, Saudi Arabia, Egypt, Bahrain, Yemen, the Maldives, and Libya all cut diplomatic ties with Qatar, citing the country's alleged financial ties to extremist groups. Although Qatar has denied the allegations, more countries are following suit—Senegal and Mauritania likewise broke ties on June 7, and the Philippines, which has been dealing with extremist militants in Marawi City, has temporarily forbidden workers from travelling to Qatar. The immediate economic shockwaves following the announcement have been immense—Qatar's stock market has plunged by 7.27%, costs of food have shot up, oil prices have dropped, the riyal currency has sharply depreciated, transport from and in to the country has been disrupted, and entire trade and import routes have been eliminated altogether. Although Qatar is one of the richest countries in the world, it will have to make monumental adjustments to its economic structure to adjust to these rifts. On May 19, United States President Donald Trump embarked on his first series of foreign trips for the current presidential term. His first stop was Riyadh, the capital of Saudi Arabia, where he met with King Salman bin Abdulaziz, Crown Prince Muhammad bin Nayef, and other members of the Saudi royal family. During the two-day visit, President Trump and King Salman signed arm deals worth an immediate total of $110 billion, with additional promises of further investment over the next decade that will eventually equate to $350 billion. On a wider scale, the arms deals are part of a larger series of potential deals between Saudi Arabia and the U.S, often involving specific corporations from each nation. Collectively, they encompass the energy, defense, technology, chemicals, and mining sectors, signifying initiatives from the Saudi government to diversify its business from oil exports (part of the Saudi Vision 2030 plan established in spring 2016) and establish new trade relations within other industries within the U.S. Following the signings, global aerospace and defense stocks rebounded in value. On Thursday, the U.S. Department of Commerce announced that China and the United States had signed a new trade agreement, named the U.S.-China Comprehensive Economic Dialogue. The trade agreement is a result of ongoing negotiations between the two countries following a meeting between U.S. President Trump and Chinese President Xi Jinping in April. This 100-day action plan contains 10-points to be implemented by both China and the United States. For the United States, the agreement is part of an ongoing attempt to cut the trade deficit with Beijing. On April 26, United States President Donald Trump announced plans to "re-negotiate" the terms of the North American Free Trade Agreement (NAFTA) with Canada and Mexico. As related in a White House press release, the administration had intended to completely withdraw the U.S. from the trade deal, but was dissuaded from doing following conversations with Canadian Prime Minister Justin Trudeau and Mexican President Peña Nieto. At present, NAFTA stands in its current form, although the U.S. has explicitly stated its desire for major changes to the trade deal. The situation is predictive of a potentially volatile future for NAFTA and trade relations between the U.S., Canada, and Mexico. Recent reports published by the World Trade Organization (WTO) have forecast a remarkable recovery in global merchandise trade for 2017. Last year, global merchandise trade failed to reach its projected growth of 1.7%, ending the year with a growth of 1.3%, marking 2016 with the slowest growth since the financial crisis. Among other indicators, WTO Director General Roberto Azevedo blamed the poor performance in 2016 on the slowdown in emerging markets, stating that imports hardly grew in volume terms. However, the six-year trend of disappointing growth may be coming to an end as the world economy gradually begins to regain momentum. In a report released on April 12th, the WTO predicts a 2.4% growth in global merchandise trade by the end of this year, stating that, for the first time in several years all regions of the world economy should experience a synchronized upturn in 2017. In part three of our transport manufacturing blog series, we look at high speed trains. In 2013, the Japanese government set the goal of tripling its infrastructure exports, such as nuclear plants and bullet trains, to a nearly $262 billion valuation in hopes of continuing to bolster its economic growth. Pros for the Shinkansen bullet train include a sound safety record, low emissions, and punctuality, but despite its technological advancements, foreign buyers remain unconvinced of the feasibility of the bullet trains. South Korea has been under tremendous pressure as tensions increase due to China’s boycott of South Korean products, North Korea firing missiles, and the United States insisting that South Korea increase its defense. Recently, North Korea has been testing ballistic missiles and firing them near Japan and South Korea, and this has many countries concerned with their defense systems. The U.S. argued that Terminal High Altitude Area Defense (THAAD), “an American missile defense system designed to shoot down short and intermediate range missiles in the terminal phase”, was needed in South Korea to protect the country from the North. Therefore, Seoul's government agreed to increase its defense system and install THAAD on its soil. The Stockholm International Peace Research Institute (SIPRI) is an independent organization that conducts research on global security. More specifically SIPRI collects data on military expenditures and the international arms trade. SIPRI released their latest data for 2016, this Monday, February 21st. The headline of their latest data release is that global arms trade volume has reached its highest point since the end of the Cold War in 1990. While the overall global uptick is intriguing in its own right, there are also several interesting trends at both the region and country level. Following his first days in office, President Donald Trump has taken immediate action to reorder U.S. economic alliances, scheduling meetings with leaders from Mexico, Canada, and the UK. President Trump has emphasized trade deals to be one of his first priorities after entering office on Friday, January 20th. As many of us know, the North American Free Trade Agreement (NAFTA) played a significant role in the US elections, with president-elect Donald Trump clearly stating that he will renegotiate the agreement with Canada and Mexico in order to stop the outflow of middle-class jobs. Changes in NAFTA would transform the auto industry in the US since it allows automakers, as well as other suppliers, to move production to Mexico without facing any tariffs and take advantage of the lower labor costs. On the brink of recession, the small, trade-dependent country of Singapore is on track to log its slowest growth rate since 2009. Government analysts expect this year’s growth rate to be between 1 and 2 percent. This grinding halt in economic growth caused the shutdown of an estimated 42,000 businesses in the first six months of 2016. In comparison, 2015 saw the shutdown of only 49,000 businesses. The Trans-Pacific Partnership (TPP) is a major trade deal meant to strengthen economic ties among its twelve member nations (United States, Japan, Vietnam, Malaysia, Singapore, Brunei, Australia, New Zealand, Canada, Mexico, Peru, and Chile). If the TPP were to pass in every country involved in the trade deal, it would give the countries with smaller economies the opportunity to grow at a rapid pace. This trade deal would eliminate tariffs between the member nations. Countries with cheap manufacturing labor like Malaysia and Vietnam would benefit immensely from being able to export to the massive consumer markets in the United States and Canada without any tariffs being imposed. Many of the smaller countries are looking to see if the United States will ratify the TPP. Singapore’s Prime Minister has said that America must ratify the Trans-Pacific Partnership to show it is serious about doing business in the Asian-Pacific market. Currently, it seems unlikely that the TPP will be ratified by the US Congress during Barack Obama’s presidency and both of the major US presidential candidates oppose the TPP in its current form. Global economic growth has been held back in recent times and many factors play into this; however, political uncertainty has been at the forefront. Unpredictable political outcomes, such as the general election season in the world, instability in the Middle East, the Brexit, and China’s leadership reshuffle, have created considerable doubt and uncertainty in global markets. On Wednesday, OPEC reached an agreement that will cut its output of oil for the first time in eight years. The current rate of production is 33.24 million barrels per day; the new aim is 32.5 million barrels per day. The decision came to fruition at a two-day OPEC meeting in Algeria. However, it is not yet an official deal. Specific details have not been released yet, and decisions regarding individual countries' output will not be discussed until late November. Plus, there are several more related proposals from OPEC affiliates that warrant discussion. If an official deal is eventually reached and put into effect, it will undoubtedly raise oil prices (which have been cripplingly low over the past year) and help combat the global oversupply of crude oil. International trade is an exceptionally important driving factor for corporate and economic growth. Following a two year decline in international trade figures, the Organization for Economic Cooperation and Development (OECD) finally reported growth in the second quarter of 2016. Members of G20, an exclusive group of 19 countries and the European Union, showed an increase in combined exports and imports after a run of declines. The majority of G20 countries' export economies rose by at least 1.5% in the second quarter of 2016. Unfortunately, a few major countries such as Argentina, Canada, and China failed to experience export growth. After suffering a drop in soybean yields due to a drought this past year, Brazil is now facing a large shortage in its corn harvest. While many farmers had planted the corn seeds during good weather conditions, more hot and dry weather hit Brazil causing the second harvest of crops that were in the process of forming to die out. Avocados are experiencing a sudden shortage in the market, as New Zealand bandits have been reportedly stealing the delicious creamy fruit. In the past five months, 40 large-scale thefts from New Zealand’s orchards have been reported, with 350 avocados being stolen at a time. The Trans-Pacific Partnership (TPP) has been a largely controversial topic from the day discussions began. As the largest regional trade agreement in history, the agreement would set new terms for trade and business between the U.S., Canada, Mexico, Australia, and numerous other Pacific Rim countries. As a whole, this group of member countries is responsible for nearly one-third of world trade. Needing the approval of Congress, the TPP has become a topic of discussion in the 2016 U.S. presidential election. While the nominees of both major parties are both against the agreement currently, there are a number of reasons why dropping the partnership all together may not be the best idea. The USA, more than most other countries, has been reluctant to engage in trade agreements. As a backdrop, the US-Israel Trade Agreement is the oldest agreement involving the US and it went into effect on September 1, 1985. Since then, the US has signed 13 more trade agreements, covering 20 countries in total with the Israeli agreement (with 18 more agreements being deliberated). But, during the same 30-year period the world has seen 256 new trade agreements involving a large portion of the world, as registered with the World Trade Organization (see my article in The Conversation). Nineteen trade agreements were in force worldwide in 1985. Now there are 275, with 132 agreements being implemented in the last decade. The bottom line is that the US is very reluctant to engage in almost any form of trade agreement compared with the rest of the world. This blog was written using a wealth of materials promoted by the United Nations, UNCTAD, and various UN Forums, such as the World Investment Forum, but with my take on the implications and where to go from here. This inclusion of official, publicly available UN materials sets the tone for the debate about UN’s Sustainable Development Goals (SDGs), the 2030 Agenda, funding and bold leadership required, and the worldwide collaboration needed by the UN’s 193 member states. My take is that collaboration – whether it be structured as a series of multilateral agreements and/or regional agreements – is the way to go over any form of isolationism. On July 11, Canadian Prime Minister Justin Trudeau, Ukrainian President Petro Poroshenko, and Ukrainian Prime Minister Volodymyr Groysman together signed the Canada-Ukraine Free Trade Agreement (CUFTA). The agreement, signed in Kiev, is meant to further improve market access between the two countries, settle trade conditions, create jobs, and cement their status as allies. The Canadian government has been a fervent supporter of Ukraine ever since the nation's first clashes with Russia, which left Ukraine in war-torn, economically faltering conditions. Talks for CUFTA between the two countries had been going for months before final negotiations wrapped up last year. Now, the confirmation of CUFTA signifies Canada's continued support of Ukraine in the face of its struggles. China devalued its yuan in 2015 by calculating the reference rate on a daily basis and letting market forces affect the value. For some, it seemed like a good idea to get China more into the dynamic financial market. For others, it’s not playing out that way. With the Iran nuclear deal and US sanctions lifted, Iran’s market – read oil production and related industries – should open up to companies. Not really. There is just too much bad feeling and economic turmoil for some to engage. While the cases of China and Iran involved decisions being made (by China and by the US vis-à-vis Iran), TPP has been in negotiation since March 15, 2010 without an agreement. TPP, often talked about, seldom spelled out, refers to the “Trans-Pacific Partnership” and involves 12 primary countries as potential trading partners. Nineteen official negotiation rounds between 2010 and 2013 and numerous other meetings since led simply to indecisiveness. Why So Negative About Trade? International trade has become a negative phenomenon in the US election cycle in 2016 as well as influenced the BREXIT. Last year, on October 5, 2015, US President Obama used the “fast track powers” granted to him by Congress to seal the Trans-Pacific Partnership agreement. TPP involves the US and 11 Pacific nations that encompass 40% of global trade (Australia, Brunei, Canada, Chile, Japan, Malaysia, Mexico, New Zealand, Peru, Singapore, US, and Vietnam). But is US trade a lost cause and is the signing of TPP too late to be helpful for US trade? The US share of the Asia-Pacific region’s imports declined about 43% from 2000 to 2010. Gaining that back would mean an additional $600 billion annually by 2020, supporting some 3 million US jobs. Now, other countries are exporting much more to these countries, and at an increasing rate. Why is that? Celebrations and support from the people of Panama erupted on Sunday, when the expanded Panama Canal was opened on June 26th, 2016. Panama Canal is mainly used by the United States and China for trade and transportation. The new canal is said to allow for the passing of 98 percent of the ships in the ocean and will account for 80 percent of the current “world liquefied natural gas tanker fleet, compared with the 7 percent that could pass through old facilities.” With the $5 billion ten year expansion project, Panama hopes to generate three times the amount of revenue from canal shipping fees, and wants to make transportation more efficient with its new locks. However, these goals may still take some time to reach due to the drop in shipping prices and the unexpected problems that have arisen with the expanded canal. Wildfires in Canada have halted oil production, causing oil to drop for the fourth day in a row, making this the longest stretch of declining oil in over a month. Around 1 million barrels a day were halted due to the continuous wildfires over the course of May. The 5,000 square kilometer forest wildfire, nicknamed “the beast” has taken many shifts in directions, which has caused these fires to be more difficult to contain. However, municipal authorities in Alberta stated on May 20th that conditions were improving and mandatory evacuations orders for seven oil-sands worker camps have been lifted, and operations are underway again. It has been in the news a lot, many countries trying to increase bilateral trade, but it seems that Russia is one country taking the initiative to a higher level. Russia has a goal of increasing its bilateral trade with China, Pakistan, and Ethiopia. China's Commerce Ministry is upset over a massive duties increase on imports of corrosion-resistant steel. The U.S. Commerce Department announced a duty of 450%, up from 256%, on flat-rolled steel. The steel in question is typically coated in zinc or aluminum to extend its useful life. Although the Syrian civil war are has partitioned Syria into several autonomous regions, trade has continued to flow across front lines, largely aided by truck drivers. These truck drivers are responsible for crossing battlefields and checkpoints to deliver consumer goods, such as food, cars, and oil. As container ships continue to grow larger and as global trade increases, the need for automated shipping terminals is apparent. The United States has four such terminals, where computer-operated robots automatically load and unload shipping containers from massive cargo ships. There is no doubt that automation boosts productivity and cuts labor costs; however, it remains to be seen whether automation is worth the hefty investment. Somali-based piracy cost the international community over $6 billion in 2012, but the decrease over the past few years has been due to increased reliance on maritime security. The decrease in piracy around the Eastern coasts of Africa can be seen as a success; however, piracy is increasing off the coast of Nigeria and the Gulf of Guinea. The piracy in the Gulf of Guinea is likely due to the lack of prevalent law enforcement, the easy access to illegal markets, and a target rich environment. The expansion of the Panama Canal has overcome labor disputes, legal battles, and even technical issues, but the project is almost complete. When projects such as these occur on such a massive scale, big delays and budget overruns are inevitable, but usually the financial backers can always find the money to complete the projects. However, this may not be the case for the Nicaragua Canal. This canal is being built in order to allow large Post-Panamax ships to travel as the Panama Canal’s current locks are not big enough. Nicaraguan officials also believe that the investment will boost the economy and living standards. The canal would be one of the largest infrastructure projects in human history, but many are skeptical as no evidence of actual construction has been found since August 2015, despite the Nicaraguan government insisting that ground was being broken. Since 2007, a construction project has been underway for a third set of locks for the Panama Canal. Undertaken by the GUPC, the completion of locks was delayed for years due to construction problems and contractual issues. However, it looks as though the project is nearing fulfillment. Earlier this month, the consortium behind the expansion announced they were ready to enter the trial phase for the expanded waterway. In a series of over 2,000 investigations, the GUPC plans to test the control systems and electric power that operate the new locks in the Pacific and Caribbean sections of the canal. After this phase, the plan is to run a set of navigation tests during the month of May. If all tests are successful, an expanded Panama Canal could become a reality in the second half of the year. There is no question that a slowdown in global trade can have far-reaching implications. Weakened demand for commodities in Asia and an economic slowdown in key emerging markets, particularly China, have caused global trade to stall. This trade slowdown, coupled with falling freight rates, has left the global shipping industry in dire straits. Further U.S. Sanctions on Iran? On Tuesday, Iran launched a large number of ballistic missiles from silos all over the country. According to reports, the missiles can cover distances ranging from 190 to 1,242 miles. Reports from a local news agency reported that the missiles were launched as part of a supposed military exercise. An official statement from The Revolutionary Guards, a division of Iran's Armed Forces affiliated with the Islamic Revolution, declared that the missiles were launched to showcase Iran's "deterrent power" and "all-out readiness to confront threats". The United States has reacted unfavorably to the news. Just two months ago, the U.S. had imposed sanctions on Iran in reaction to missile tests run by the country last October, meant to disrupt further activity. Now, additional sanctions against Iran may be on the discussion table. In the G-20 summit this past weekend, the world’s finance ministers agreed not to engage in currency wars to boost exports. Currencies in emerging markets have been battered since the financial crisis began in 2007. Traditionally, countries expect a payoff in a boost of exports when their currency is weak; however, it’s not been the case this time around. This is the case not only due to slowing growth in China and rapidly decreasing oil prices, which has hurt commodity exporters, but also the Federal Reserve’s increase in interest rates. The possibility of interest rate increases in the United States has put pressure on currency markets. A referendum is a vote in which nearly anyone of a voting age can take part in, and can cast a “Yes” or “No” vote to a question, and whichever side has over half of the votes cast wins. U.K.’s Prime Minister David Cameron announced a referendum on June 23, 2016 to vote on whether the United Kingdom should remain a part of the European Union. Britain held a referendum in 1975, and voted to stay; however, there are many who called for another vote because they argued that the European Union has changed over the past 40 years. The United States government has approved the construction of a $5 to $10 million dollar heavy equipment factory in Cuba’s Mariel port and special economic zone located 30 miles west of the Cuban capital of Havana. This announcement comes merely 15 months after the United States and Cuba announced plans to normalize relations. The Oggun Tractor Plant, as it is to be named, marks the first significant American business investment in the small island nation since the rise of Fidel Castro in 1959, when $1.8 billion dollars (estimated present day value of $7 billion) worth of American corporate and private property was nationalized. Two new U.S. International Trade Administration (ITA) resources are now available on globalEDGE and they can be found in the U.S. Trade Resources tab of the country pages within the Global Insights section of globalEDGE. ITA Trade Leads provide contract opportunities for U.S. businesses selling their products and services overseas. This new resource is particularly important for U.S. businesses because it’s often difficult for them to learn about overseas opportunities, especially those within complex industries where partnerships and sub-contracts are the norms. Currently, these leads come from six different sources and are updated daily. Users can browse through all of the available trade leads for a certain country or search the leads using keywords. ITA Consolidated Screening List (CSL) is a list of parties for which the United States Government maintains restrictions on certain exports, re-exports, or transfers of items. This resource conducts electronic screens of potential parties to regulated transactions. In the event that a company, entity, or person on the list appears to match a party potentially involved in your export transaction, additional due diligence should be conducted before proceeding. CSL is a collection of eleven export screening lists of the Departments of Commerce, State and the Treasury, and it is updated daily. Lists of screened companies, entities, and individuals can be browsed by country or can be searched by keywords. Are you interested in the global trade initiatives of the Michigan Economic Development Corporation (MEDC)? How about properly pricing a product or service in a new market or the trade opportunities for U.S. companies in Norway? If the answer is yes, be sure to check out the globalEDGE Business Beat today. The globalEDGE Business Beat is a radio show hosted by Dr. Tomas Hult from the International Business Center at Michigan State University that features conversations with experts in the field of international trade. These podcast segments are rich with international business knowledge and are a great way to improve your international business acumen. For the first time in 15 years, the International Monetary Fund (IMF) has changed the structure of the special drawing rights (SDR) basket and has announced the Chinese yuan to be a new official foreign reserve asset. This change not only acknowledges China's monetary reforms, but also accelerates the yuan’s internationalization. This blog will explain the challenges and benefits that China is facing with respect to the inclusion of its currency in the SDR basket. 2015 has been a tough year for international trade, as new statistics show this year is on pace to be the worst year for trade since 2009. The numbers were a surprise compared with earlier projections, and have led to worries among some economists about the health of the global economy. The IMF had expected a 3.1% increase in trade volume compared to last year, but through three quarters of 2015, trade has only grown 0.7%. Analysts have highlighted lower demand from the Eurozone as well as an economic slowdown in China as major factors in the low trade numbers. El Niño is a weather and climate phenomenon which is characterized by unusually warm sea and surface temperatures and can be measured by ocean temperatures and atmospheric convection activities. The change in the sea temperature can affect the timing of when the heat transfers from the oceans into the atmosphere, which can affect temperature and rainfall patterns. Historically, El Niño has immediately impacted the agriculture sector, but its effects can also be felt later in the global marketplace. A new segment has just been added to the resource tab of the country pages within the global insight section of globalEDGE. For all countries with available information, the U.S. International Trade Administration (ITA) Offices resource has just been added and now provides user with contact and address information for almost 200 ITA centers worldwide. For example, the United States resource tab has information for every ITA office located within the U.S. The ITA provides companies with advice on exporting, international sales, logistics, finance, and trade dispute resolutions. This has the potential to become a very useful resource for globalEDGE users of any kind. From a company trying to contact an ITA office for advice or help to a student doing research, having access to the ITA offices around the world opens many doors and allows globalEDGE to bring even more global business knowledge to its users. The low oil prices have had both positive and negative effects in the short-term, but the long-term effects are less known and are thought to have wide and long-term impacts on the global economy. Low oil prices have reduced gas prices and have allowed people to save money at the pump. Lower gas prices can help people who have lower incomes and can also reduce costs on energy bills for those who live in cold climates. The automotive industry has sold more cars while gas has been less expensive, which has caused total vehicle sales to climb from 12 million per month to nearly 18 million. In addition, transportation companies benefit from lower fuel costs, as does any business that has to pay fuel bills to power its operations. As of October 15, 2015, USA Trade Online is now free for all users. For those who are not familiar with USA Trade Online, it is a dynamic data tool provided by the U.S. Census Bureau that provides U.S. export and import data. In addition to becoming free for all users, many new data fields and functions have been added. These changes have made this resource an even more powerful tool for exploring U.S. international trade data. On Monday, October 5, 2015, the Trans-Pacific Partnership (TPP) was officially signed into existence by the twelve Pacific Rim nations.The countries involved in the deal include the United States, Japan, Canada, Mexico, Australia, New Zealand, Chile, Peru, Malaysia, Vietnam, Singapore, and Brunei. China, the world's second-largest economy and the biggest trading partner for over half of the countries involved in the TPP, was not included in the list, and they are hesitant about showing support for the new deal. The Internet has become an indispensable element in peoples' lives in the 21st century. South Africa is no exception. The Internet user base in South Africa increased from 2.4 million in 2000 to 12.3 million in 2012. The increasing number of internet users presents great opportunities for online businesses. As part of the normalization process that began a little less than a year ago, the United States has taken additional steps in renewing full relations between itself and Cuba. On September 18th, the U.S. government announced revisions to its sanctions against Cuba that would make business and travel between two countries much easier. On top of this, President Obama may be working to end the embargo that the United States has on Cuba. Insistence on removing the embargo comes from personal requests by Cuban President Raul Castro, Pope Francis, and the United Nations, who condemned the embargo. Obama may aid Cuba in ending the embargo to the U.N.'s wishes, an unprecedented move by a world leader. While most are in favor of continuing to open trade between the U.S. and Cuba, completely removing the embargo proves to be a controversial subject. On Monday, August 24th, Chinese stock markets fell by 8.5%, creating a major crash in the Shanghai Composite. Investors have called this day China's 'Black Monday' because of the dent it has left in China's business as well as the consequences it has caused for the global economy. The crash was caused by many factors including the staggering amount of people investing in the Chinese stock market, suffering businesses with high stocks and prices, margin calls, and the sudden selling of stocks by these same investors. The stock market crash has had damaging effects on billionaires and global markets. Although some markets seem to be in recovery, the crash could be seen as a sign of a bigger problem in China. Even though global market trade has been in a bit of disorder lately, great advances are expected in trade between Asia, Africa, North America, and Europe by the year 2020. Currently, China's trade is growing, just not at margins seen in the past. With only an expected annual growth rate of 5% over the next five years, China's slowing trade growth comes at a cost from weaker growth among emerging markets. This slowing of China's trade will lead to new trade expansion in the global market. Sporting events, such as the Olympics, have been thought to be large magnets for foreign investment, and large sums of money are often spent on developing state-of-the-art facilities. These sporting events have played a large role in raising awareness for the host country on the global stage and developing infrastructure. The 2015 Special Olympics World Games were recently hosted Los Angeles, California, and Brazil will be hosting the 2016 Summer Olympics in Rio de Janeiro. China recently won the bid to host the 2022 Olympics, but the International Olympic Committee has been struggling to find suitable cities to host the 2024 Summer Olympics. However, lately there has been debates regarding the economic benefits of hosting the Olympics. El Niño is a weather and climate phenomenon that is characterized by unusually warm sea surface temperatures. During the El Niño, warm water moves from the Western part of the Pacific Ocean to the Eastern equatorial Pacific Ocean, often accompanied by a change in trade winds. This occurrence can cause significant economic impacts, which could directly impact the agricultural economy first, but later can be felt in the global marketplace. In the past few years, globalization has become more apparent in its role in the global economy, where more people, countries, and economies are becoming interconnected with one other. In the book The Lexus and the Olive Tree, Thomas Friedman attempts to break down the role that globalization has played and how it can be considered as a new sort of international system for the future. Globalization often gets a bad rap and serves as the punching bag for many international issues. Because of this harsh under appreciation of the increasingly influential force that connects the world, global trade also comes under fire. The reliance of superpower nations on multinational corporations is perceived more frequently as a weakness due to inescapable interdependence. In A Splendid Exchange, William Bernstein manages to provide the reader with insight on key economic concepts found in trade since the origin of the first silk passages. Refreshingly honest, Bernstein accounts the major events and development of the global market, theorizing that trade is the single common denominator through past eras. Often villianized in terms of the global marketplace, trade is something that has shaped the world we so comfortably inhabit in the present. In hopes of inspiring nearly 1 trillion dollars worth of economic activity, African leaders will officially announce a new pact known as The Tripartite Free Trade Area (TFTA) at an upcoming summit of the African Union in South Africa. The new free trade zone will cover 26 countries in the area from Cape Town to Cairo, becoming the largest free trade zone on the continent. Three current trade blocs within Africa are to merge as one, the Southern African Development Community (SADC), the East African Community (EAC), and the Common Market for Eastern and Southern Africa (COMESA). Oil prices dipped on Monday due to the rising value of the dollar and the potential for an oversupply of oil. Global conditions and the turmoil in the Middle East caused oil barrel prices to rise, especially due to the gains that Islamic State militants made in Iraq after seizing the provincial capital of Ramadi. In addition, the dollar continued to rise against other major currencies, thus making raw materials less affordable to holders of the euro and other currencies. Globalization can be defined as the process of interaction and integration among the people, companies, and governments of different nations, a process driven by international trade, investment, and information technology. It is not a new concept, and has been present for thousands of years, as people and corporations have been buying and selling goods and services, along with exchanging ideas across long distances. With the proposed re-establishment of normal diplomatic relations and the potential easing of economic sanctions between the United States and Cuba, trade relations between the two nations have begun to thaw. Cuba offers a new market of avid consumers, and an economy that could potentially be a key contributor to the Caribbean region. Even though the embargo may potentially be lifted, there are several challenges that remain to be overcome for Cuba and U.S. to be successful as trade partners. Too Sweet of a Deal? Recently, Hershey blocked Cadbury's products from being imported to the United States by reaching a settlement with Let’s Buy British Imports, or L.B.B. These agreements forced L.B.B. to stop exporting Cadbury chocolates made overseas to the United States. As Africa becomes more integrated into global value chains, existing trade agreements are not enough to fulfill the increasing foreign investments because they are complex and obscure. With the hope of creating easier access to global market for local businesses, the three largest trade groups in Africa came up with the idea of the “African Free Trade Zone,” which aims to create a single trade union in Africa. The idea has been evaluated since 2008 and finally it will be realized later this month. Governor Rick Snyder of Michigan recently returned from a week long business investment trip to China. In an effort to promote international trade, Snyder continued his mission of increasing trade between Michigan and Asian countries. Snyder first embarked on this mission in 2011 and has made trips every year since. He has visited China, Japan and South Korea with a concentration on the automotive industry. He wishes to build a long term relationship to increase business investments. After eight years of negotiation, China and Australia finally drew a free trade deal on last Monday. This agreement signals a transformational change in the economic relations between China and Australia because trade tariffs in dairy, beef, and horticulture products will be completely eliminated within the next couple years. Without a doubt, it will greatly facilitate the trade between these two countries. On the other hand, Canada, one of Australia's main competitors, is now worried about its exports to China. It has been almost a year since the expiry of the 75-year-old concession of Abu Dhabi with western oil companies. Having been working as service providers and not getting paid in oil this past year, the Western oil companies are among the hopefuls to win the bidding for Abu Dhabi’s new oil concession. These companies are hoping to keep their stakes in the Persian Gulf, which is the one of the few major oil-producing areas that allows international companies to hold direct shares. Now they are worried about losing their stakes because of the rising interest of Asian oil companies in this lucrative oil business. Businesses around the world are starting to realize the potential Africa has for global business growth. With more than half of its population being under the age of 35 and its middle class on the rise every day, companies especially in the US are funneling money into the continent in hopes to rope in some of the business opportunity. Just last week, the World Trade Organization seemed like it was going to pass the Trade Facilitation Agreement (TFA) when India decided not to sign the deal, citing concerns over food security. The TFA was the WTO's first landmark trade agreement, designed to ease and liberalize trade between its over 160 member countries by changing tariff and duty systems, as well as cutting down on red tape. These trade revolutions, it claimed, would have created over 20 million jobs and added $1 trillion in trade output. The idea for the deal was born during the WTO's conference in Indonesia last winter, and the deadline for agreement and signing the deal by its member countries was on July 31 of this year. With India backing out of the deal, however, it seems as though the TFA has been doomed to oblivion....or has it? International Trade Show: Food Show PLUS! There are many widely known benefits to exhibiting at a tradeshow. You are able to market your product, network and, ideally, generate new business for your company. Unfortunately, however, tradeshows are notorious for being costly. As Forbes contributor, Brent Gleeson, put it, “planning and goal setting is critical to generating a positive ROI from your tradeshow investment." Food Export – Midwest’s Food Show PLUS! program helps companies to do just that. Through its various services, Food Show PLUS! ensures that major international tradeshows are utilized to their full potential by assisting companies in the areas of research, preparation and translation. It is also possible for companies to apply for the Branded Program which offers up to a 50% reimbursement for several expenses related to exhibiting at international tradeshows. If you are considering introducing your products to foreign markets, Food Show PLUS! can give you the tools you need to find success. In what would be a great engineering feat, plans for a canal to connect the Atlantic and Pacific Oceans in Nicaragua have been finalized. The idea of a Nicaraguan canal goes back to the 19th century, when officials in the United States looked into the feasibility of a canal project. Nicaragua ended up being passed over when Panama was chosen as the site for a trans-oceanic canal by Congress in 1902. After the Panama Canal’s construction, talks of a Nicaraguan canal died down until the early 21st century. With increasing world trade and the need for quick shipping, the idea of a second canal connecting the Atlantic and Pacific Oceans was proposed by the Nicaraguan government. Negotiations on the proposed Trans Pacific Partnership (TPP) heated up over the past week during President Obama’s visit to Asia, although no major breakthroughs in the talks were announced. The negotiations slowed down during the President’s visit to Japan, as talks between the United States and Japan focused on the auto industry; the two countries have long had a rivalry in the auto sector. Japanese car companies entered and ended the Big Three’s dominance of the US market during the 1970s. This tension has continued today, influencing the trade discussions and preventing the countries from reaching a deal during last week’s negotiations. Organic food is increasingly becoming an active topic in international trade due to the increase in people’s living standards worldwide, improved transportation, and urbanization. In developing countries, we see that people consume more organic food now as a result of higher income, and this increases the national demand of meat products, which leads to a large inflow of live-stock feed to developing countries. However, in developed countries, organic food is not necessarily associated with high income populations, but rather with people with diversified diets who wish to eat naturally developed food. Last week, a panel from the World Trade Organization announced that China had broken international trade law by restricting its exports of rare earth metals and other metals critical to the global manufacturing industry. The panel discovered that the export taxes, quotas, and bureaucratic delays in Beijing artificially raised the prices of exports and created shortages for foreign buying nations. The panel also determined that these export quotas, which the Chinese argued were intended for environmental protection, were actually instituted to achieve industrial policy goals aimed at promoting the continued growth of the Chinese economy. The North American Free Trade Agreement (NAFTA) came into effect January 1, 1994, creating the foundation for economic growth and strengthening trade relations between Mexico, Canada, and the United States. Now in 2014, it has been over 20 years since NAFTA has been in place. To better understand the economic impacts of NAFTA, we have prepared a table showing trade statistics before and after NAFTA. On February 19th, President Barack Obama flew to Mexico to meet with Mexican president Enrique Peña Nieto and Canadian prime minister Stephen Harper, approximately twenty years after the three nations had signed NAFTA. The goal of the Toluca summit was to attempt to reduce trade frictions and come to agreement on trade conflicts between these countries. Issues discussed included Obama's trade executive order, the controversial Keystone XL oil pipeline, the "trusted traveler" program, updating NAFTA, and the Trans-Pacific Partnership. Few things are more for the global economy than world trade. Ever since Adam Smith laid out the economics of comparative advantage in his magnum opus, The Wealth of Nations, countries have understood the importance of specialization and trade. The importance of trade remains the same today - if not more important. The evolution of technology has opened the Internet for cross-border collaboration and has enabled a whole new range of economic activity that includes online trades, big data, and online advertising. According to the McKinsey Global Institute, from 2004-2009, the Internet contributed up to 21 percent in GDP growth in the developed world and 11 percent in the BRIC countries (Brazil, Russia, India, China). This blog will discuss the international trade benefits created by the Internet and the risks associated with online cross-border trade. What is the Future of the Trans-Pacific Partnership? The Trans-Pacific Partnership, or TPP, is a trade agreement between twelve countries, including China, Japan, the United States, Canada, Mexico, Chile, and Peru. This agreement, if ratified, would eliminate almost all trade barriers between these twelve countries, uniting them in the largest free-trade zone in world history. The problem is, it doesn't seem to be getting approved anytime soon; talks that occurred just last week in Singapore ended with the countries reaching no finalized agreement that would put the TPP into effect. As the partnership has been undergoing negotiation talks for years, it is wondered how much longer it will take for the countries to cooperate on certain final issues and establish the partnership. In a meeting last week, the leaders of the United States, Mexico, and Canada got together and discussed various issues surrounding their own countries, including forming new trade agreements to open up more trade across the globe. These three countries entered into their own agreement 20 years ago when they signed the North American Free Trade Agreement (NAFTA), which was a significant step for regional trade in the Western Hemisphere. Now, these three countries hope that they can use NAFTA as a springboard to form new agreements with other countries in an attempt to find new markets and diversify their own economies. Mitigating climate change and the shortage of natural resources require rapid and widespread development of renewable energy. As the demand for renewable energy has increased largely in the past 10 years, the number of renewable energy trade disputes is also rising. A number of countries have found that their feed-in-tariff (FIT) programs are at odds with the fair trade agreements in the international trade of renewable energy. Therefore, this post will introduce the impacts of trade barriers on the international trade of renewable energy. China's economy has politicians, investors, and businessmen all over the world biting their nails in nervous anticipation. Business and investment in the country have become increasingly risky and low expectations have been predicted for several sectors of the economy. The country as of late has been able to hold their own and beat their dismal forecasts; however if it does not stabilize its economy soon, it could prove bad news for the country and for the global economy. In a world with a clearly-defined gap between developed, larger countries and small countries categorized by political turmoil and radical militant groups, it is difficult to recognize the growth of peace and stability. United States based companies often view currently developing countries as risks due to economic instability. Nevertheless, these low-to-middle income countries are increasingly becoming more stable and present the potential to be beneficial business associates. Latin America has not had one of their best economic years. The International Monetary Fund has predicted a lower-than-average 2.7 percent growth in Latin America's total economies. This is not surprising, seeing as several factors such as poor trade, inflation, and slow economic growth are affecting many nations from this region in a rather devastating manner. Here is a closer look. 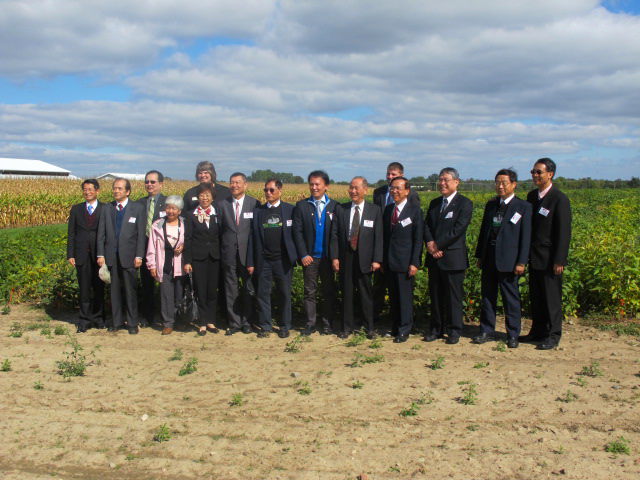 The Director of the Michigan Department of Agriculture & Rural Development, Jamie Clover-Adams, and the International Marketing Program traveled with Governor Snyder on a ten-day trade mission to China and Japan in September. On Sunday, China opened a new, 28 square kilometer free trade zone in northern Shanghai. The zone will feature loosened restrictions compared to greater China, such as more freedom for banks and the opening of several industries. Foreign investors and companies hope the new zone will allow for easier access to the Chinese market, but the Chinese government has released few specifics on the regulations and rules of the zone. This has brought along skepticism on whether the zone will have any meaningful impact. Expanding the Panama Canal: What Does it Mean? In 2006, the people of Panama overwhelmingly approved a national referendum to expand and enlarge the Panama Canal. This $5.25 Billion project, currently 6 months behind schedule, is due to be finished around June 2015. The project will double the capacity of the canal by adding 4 new locks, which will be able to handle much larger ships, known as New Panamax. The question becomes how the expansion will impact global trade and shipping routes. In the five years that the globalEDGE blog has been operating, much has changed in the area of global trade and investment. It all began when the global financial crisis came about in 2008 and this led to major changes in the global trade markets. Global trade relative to GDP plummeted around thirty percent during the financial crisis, and the crisis seemed to have come from problems such as poor trade regulation, bad credit, and poor bank strategies. There are many changes that have been made to the global economy and many challenges that have been faced in the area of global trade since 2008. Here’s a look at what has happened. Exports continue to help grow and expand Michigan’s food and agriculture economy, while generating nearly $2.8 billion in economic activity with support from the nation’s second most diverse agriculture industry, strong public and private investment, and a diversified portfolio for food processing. Exports of consumer food products are growing three times faster than sales in the United States due to the foreign consumers’ growing purchasing power and lower trade barriers. Thus, exporting is vital to Michigan companies as an opportunity to increase sales and profits, as 95 percent of the world’s consumers live outside of the United States. Moreover, food and agriculture producers can reduce dependence on existing domestic markets, and off-set slow sales due to economic changes, demands, and cyclic fluctuations resulting in short and long-term security for Michigan. Since the governmental reforms and the economic reforms that Australia underwent in order to make their country more relevant in global trade, China and Australia have maintained strong trade relations. Since 2008, Australia has more than doubled its trade with China. This is due to less strict trade regulations, lower taxes on exports, and a less conservative economy. Once these reforms were made, Australia transformed from a independent, isolated and small economy to a more internationally competitive economy with a more export oriented background. The international trade of consumer products is a regular occurrence and nearly everyone in the world is aware of its role in the global economy. However, how many people are cognizant of the fact that cities use imported garbage from neighboring countries and turn this waste into energy? I am guessing that not many people have heard of this phenomenon. This is exactly what is happening in the city of Oslo, located in southern Norway. Globalization is the worldwide movement to increase the flow of goods, services, people, real capital, and money across borders in order to create a more integrated world economy. Previously, I wrote of international trade in antiquities, but let take a look at trade during antiquity and how it has affected today’s economy. Trade networks have always followed the trends of politics, economics, technology, and most importantly culture. Exotic luxury goods demanded by elites encouraged trade to gain momentum: Incense Route, Silk Road, Amber Road, Spice Route, and Tea Route. Soon, economics became so interconnected that World Systems became dependent on each other. Japan is the world’s third largest economy and the United States is the largest economy in the world ranked by GDP. But, these two huge economies do not have a free trade agreement, which strikes the question – why not? Obviously, there are a lot of reasons why these two great nations have not struck a deal yet, but one could be on the horizon. “Trade creates wealth”: an age-old saying oft used to break international boundaries for the free exchange of goods, services, currency, and capital. But this age-old saying does not hold true when it comes to the underground economy of old-age empires’ wealth. Trafficking antiquities not only creates sinkholes in the public goods marketplace, but it also depreciates cultural heritage sights. Furthermore, these black market deals are exponentially increasing the rate of cultural homogenization by privatizing potential world-heritage commodities. Why be entrepreneurial with a public good like history? It is far more meaningful for archeologists, history enthusiasts, and the inquisitive society. Due to its unauthorized, undisclosed, unregulated, and highly informal, the black market for antiques can only be scratched at surface level but three distinctive vacuums emerge: currency, knowledge, culture. Do Environmentalists Oppose Alternative Energy? The World Trade Organization is investigating an Indian governmental program that requires solar energy producers to use Indian manufactured solar cells instead of imported products. Several U.S. environmental groups are pressing the WTO to not pursue action against India, saying that ending the program would threaten the ability of India to cut greenhouse gas emissions. The irony is that India’s green energy industry would be harmed if no action were to be taken, a blow to the environmentalists goal of increasing alternative energy use throughout the globe. What is a Currency's Fair Value? How do you know if a currency is overvalued or undervalued? Well, there are currently many measures that contribute to determining the fair value of a currency. One common measure is evaluating purchasing-power parity (PPP) and another is determining whether or not a country’s trade deficit or surplus is representative of the country’s fundamental economic attributes. Although these factors can together accurately determine a currency’s fair value, a universal method is still lacking. For years, Africa has been viewed as a continent stricken by poverty with practically no chance of achieving sustainable economic growth. Just over 12 years ago, The Economist even labeled Africa as “The Hopeless Continent” plagued by war and disease. However, that paradigm is beginning to radically change. Over the past decade, Africa has been the second-fastest-growing region in the world with an annual growth rate of 5.1 percent. To the surprise of many, over 500 African companies have annual revenue of $100 million or more. How has Africa been able to turn around its fortune in such a short period of time? Many believe this economic turnaround can be attributed to greater political stability and reforms that have unleashed the private sector in many African countries. Though, the main source for this economic resurgence has actually been globalization as you will soon see. In recent years, the Chinese and Latin American business relationship has done very well, especially in the South American countries. China is now the main market for most of the exports for Latin American countries, along with being a big source of imports as well. There has been much greater investment in Latin America by Chinese companies such as mining in Argentina, Brazil and Peru, manufacturing in Brazil and Uruguay, and tourism in the Bahamas. With all of these influences from China taking place, there have been some major imbalances of different kinds. Latin America, a region once plagued with high inflation, has seen a drastic shift in spending and consumption trends in the past decade. This shift of consumption has been due to multiple factors, particularly the economic boom and declining poverty of the region. In the past decade, 50 million people in Latin America have joined the middle class according to a World Bank study. Agriculture has been an essential industry for nearly all major economies in the world. These countries use agriculture to drive international trade and create jobs. In the United States, agriculture is one of the most export dependent sectors of the economy with one-third of US agricultural production exported annually. Developing countries have realized the importance of creating economic growth through agricultural production and exports. With an increasing global population, agriculture has provided emerging economies opportunities for growth and integration into the global economic picture. In a global economy marked by unemployment, it might be surprising to hear that one industry is actually booming with career opportunities. That industry happens to be Big Data and business analytics. By 2018, the United States alone could face a shortage of 140,000 to 190,000 people with deep analytical skills. According to a McKinsey Global Institute report, the big data industry will also need over 1.5 million people in the next few years capable of analyzing data that enable business decisions. Global companies have begun the search for employees with complex skillsets and the ability to analyze large amounts of data. As you can see, big data is becoming ever so important for international business. When the financial crisis hit the world in the fall of 2008 most sectors of the economy came crashing down with it. International trade was no different, and by some measures the decline was more pronounced. When world GDP began to contract and hit its bottom in 2009, exports dropped nearly 30%. One would expect a certain amount of withdrawal when a crisis of this magnitude hit but with such a huge drop off the question arises what other factors could have played in? The answer is not as simple as it may seem. In 2010, countries around the world engaged in a race to the bottom to devalue their currencies in hopes to boost exports and thus foster economic growth. Now in 2012, fears of another currency war have arisen again after the Federal Reserve announced the third round of quantitative easing which has caused many to believe that the U.S. dollar will weaken. It’s still unknown if central banks in other countries will respond by keeping the value of their currency low relative to the dollar. The main goal of weakening a currency’s value is to increase exports by making goods cheaper in relation to other countries. So what exactly does this mean for international business? After an 18-year effort, the Russian Parliament has finally approved the country's entry into the World Trade Organization. While the other nations of the W.T.O. had agreed to Russia's entry in December, the acceptance still required a majority vote in Russia's lower house of Parliament, known as the Duma. What could have been a routine acceptance, since President Vladimir Putin's United Russia party controls the Duma, was interrupted by strong opposition by the unusually vocal Communist Party. As the ratification dragged on, Russia's economic minister Andrei Belousov warned lawmakers that the agreement reached towards the end of 2011 would expire if not ratified by the mid-July deadline. This sparked a vote by the Duma, which voted 238 to 208 in favor of joining, with one abstention. Over the years, clean energy sources have become extremely popular as countries and governments around the world try to mitigate climate change by reducing carbon emissions. One of these clean energy sources is solar power which converts sunlight directly into electricity. Solar power has been used as a major energy source for many applications such as providing electricity for residential homes and industrial equipment. Recently, solar power has been applied to many new projects. One of which is shipping and if successful, solar powered shipping can have large impacts on the environment as well as international trade. Africa is a land with vast natural resources, but they come at a high price. Africa is known for having some of the most unstable countries in the world. Even with these dangers, China has broadened its exposure in the region to secure the natural resources needed by the factories and businesses of the world’s fastest growing economy. Latin America is on the rise. Not only has the region experienced a significant amount of economic growth in the last decade, it has begun to dominate large areas of trade worldwide. Latin America contains a large amount of land, along with a large population ready to drive its international success. While often Latin America is looked at as impoverished, author Raul Rivera points out that in fact Asia and Africa are much poorer regions. Latin America is filled with natural resources, and a population that is ready to explore more business ventures. Although the BRIC grouping of emerging economies does not include a single representative from the African continent, many economic experts and multinational corporations see enormous growth opportunities across the continent. While most businesses are now aware of opportunities in countries such as Brazil, India, and China, corporations truly utilizing global expansion as a growth opportunity are looking beyond these popular markets. More than 12 African nations have seen economic growth exceeding six percent for six consecutive years. The United States-Colombia free trade agreement approved just a few months ago has helped business growth in Colombia and is expected to continue to help boost Colombia’s economy. The main benefit from the free trade agreement is often seen as attractive conditions for increased exports and imports. However, some companies in Colombia see the main benefit coming from the growth of demand that the free trade agreement will likely generate. Besides these major benefits, there are also many other positives for business in Colombia derived from the newly passed free trade agreement. Exciting news! The United States Trade and Development Agency, in coordination with the U.S.-Egypt Business Council and the U.S. Chamber of Commerce, as well as the Egyptian Embassy and the U.S. Departments of State and Commerce, will be hosting a two-day forum on June 27-28 to encourage enhanced trade and sustainable economic development in Egypt. This conference, being held this year in Washington D.C., will provide an unprecedented opportunity to foster increased cooperation and trade between the United States and Egypt by encouraging business-to-business networking and highlighting commercial opportunities and financing resources. A massive project to renovate the Democratic Republic of Congo’s broken-down railway network has been launched in the capital city of Kinshasa. Most of the rail track in Congo was laid more than 100 years ago, so repairs and improvements are huge necessities. Costing a total of $600 million, this project is being backed by China and the World Bank with an estimated completion time of four years. The major goal for the revamped rail system is to restore services to provinces where rail is the only connection to the rest of the world in the absence of roadway and river transportation. This project has huge implications for businesses and bordering countries looking to trade with the Democratic Republic of Congo. In 2009, China became Brazil’s largest trading partner in the world, overtaking the position that the United States has held since 1930. Brazilian exports are increasing rapidly to meet China’s immense demand for raw materials and commodities. On the other side of this trade relationship, cheaper goods imported from China are opening new horizons for Brazil’s growing middle class. This commercial relationship between these countries is continuing to grow and has reached an entirely new level. As the benefits of international trade increase, many countries search around the globe for reliable markets that provide vast opportunities for exports and foreign investments. Over the past years, Latin America has proven to be a very important and dependable market for U.S. exporters. Incoterms are standards for international trade that provide a consistent interpretation of agreements included in global business contracts. Every ten years, the International Chamber of Commerce makes updates to the standards based on changes in the global business environment. As of January 1, 2011, the new Incoterms 2010 are officially in effect. The revisions listed below are a reflection of widespread changes in international business markets over the past decade. The Wall Street Journal brought together CEOs of 100 major corporations to discuss their thoughts on recent economic challenges. During the meeting in Washington D.C., CEOs argued that the only way to increase jobs in the United States is to embrace increased global trading relationships. This plan would necessitate government and business leaders to work together and promote free-trade agreements that would open doors to international markets. Free trade agreements (FTAs) have long been in controversy. By some they are hailed as the end all be all of economic growth, while others view them as a tool for the strong to exploit the weak, or a hindrance of worker’s prosperity. While there are degrees of truth to both arguments, the fact remains, trade increases, economic activity increases, and average wealth increases. FTAs need to be utilized with caution however, as many industries in many countries are not up to the competitive standards of the established powerhouses of developed countries. In addition, first-mover advantages often need to be cultivated in insulated environments where kinks in production can be removed and experiments explored without loss of the initial advantage. All of that being said, FTAs drive competition, and competition, in the end, is the best driver of economic growth and innovation.